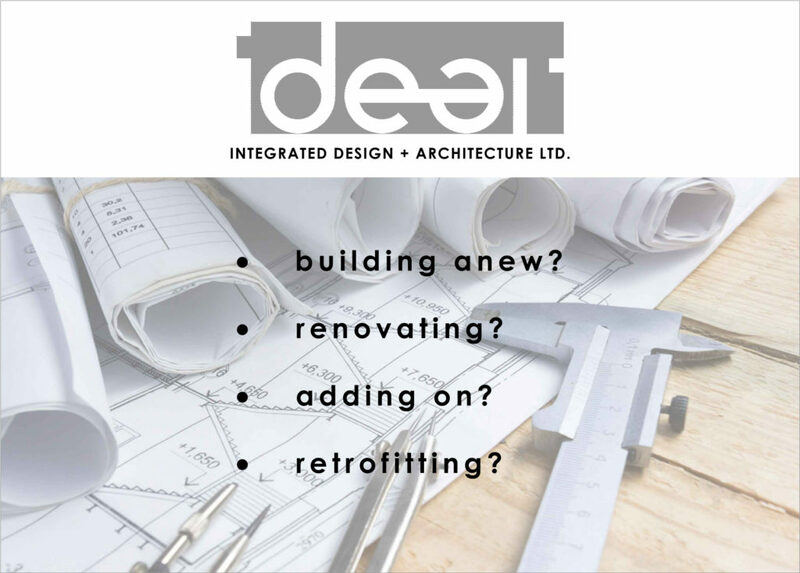 IDeAr offers full architectural services, from feasibility study and conceptual design, through planning, drafting/modelling and documentation, to project coordination and construction administration for residential and small commercial developments, be these new-build or addition/renovation. We strive to exceedingly meet our client's requirements while fully considering and integrating the environmental, energy and human impact of design decisions, in order to enhance the overall building's performance, comfort, durability and aesthetic. and firmly believe in the benefits of true collaboration between all primary parties involved (owner, architect, consultants, contractor) throughout all phases of a project, with the clear goal of optimizing processes and results. We are more than happy to help private clients, builders/contractors and developers with any and all architectural design needs. *Min. 8 to 12 hours of 'diagnostic', very useful pre-design work by a licensed professional! 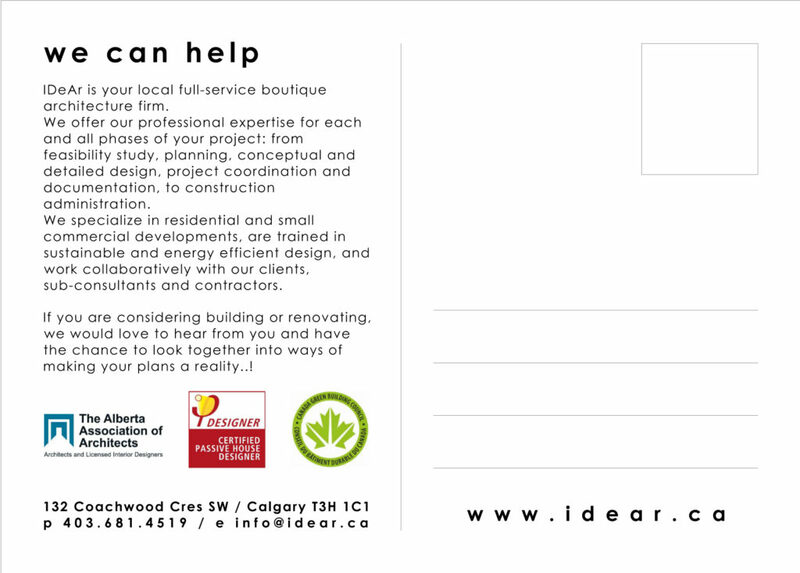 An affordable but foundational piece in any building/renovation project, the Needs & Options Review, also known as feasibility study, offers the opportunity to narrow down aspirations and requirements, priorities and realistic possibilities, in order to better define the extent and scope of work ahead and lay out a path to optimal results, well before any actual design and construction happen. Delivered in the form of an LCC or 'low commitment consultation' with a professional designer, the resulting brief will provide the client with a useful and tailored roadmap to guide him/her through the process of planning and building. It will allow him/her to more wholly understand the demands and potential, constraints and possible roadblocks for the project, as well as help determine if this working relationship is a fit for both parties before fully committing to further design services. A site visit: a chance to get to meet you personally, look at and take note of existing conditions, learn about your ideas and discuss your preliminary objectives for the project. Based on our findings from the meeting and any other available information, we will develop an outline brief clearly describing overall project goals and programmatic requirements (room functions, relationships, sizes, orientations, etc.). We will prepare a site analysis to identify regulatory and zoning issues and restrictions, conceptual layout and massing options, a high level budget estimate and a preliminary schedule for the project. A 3 to 5 pages "Needs & Options Review" report that you can use to get an accurate proposal from us or from any other architect/designer/builder – it is yours to keep. Depending on size and complexity of the project, the investment for the Needs & Options Review is in the range of CA$250 to CA$600 (+GST), inclusive of the initial site visit and follow-up meeting, within Calgary. interested in our process and wanting to learn more? Get in touch with us and we will be happy to help you realize your project.